While browsing around the Book Expo America in NYC, I picked up several books that caught my attention. This was one of them. Talking to children about death is a difficult task, since children handle loss in many different ways. I recently wrote about how my own children handled the recent passing of their grandfather. I could have used this book when we were going through those emotions a few months ago. In the book, a boy has recently lost his grandfather and is going through the emotions that one feels when a loved one passes on. The story is a beautiful tale and follows the child on his quest to come to terms with his grief. 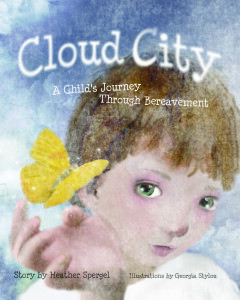 This would make a great gift for any child that is struggling with the loss of a family member or friend. My age suggestion would be between 7 and 9.